Reference number for this case: Spring-54-Gorbio. Thank you for including this reference number in any correspondence with me regarding this case. The case allegedly occurred near a city of the French Riviera later identified as Gorbio, on a forgotten date of spring 1954 and the witness definitely wanted to remain anonymous. He told what follows, noted by ufologist Jean Chasseignes. During the night, the witness was walking to return at his home. He initially heard sounds similar to that of a hammer knocking an anvil, then one minute later he hears some voices burst out and thinks that these voices must come from a nearby house. The witness did not stop walking and continued on a private pathway which he was used to walk by and which goes towards a terrace, followed by a staircase which leads down towards another terrace. After some steps on this staircase, he was amazed to see within ten meters in front of him, a luminous object landed on the ground. The object is a machine in the shape of a disc with a small dome on its upper part. The dimensions of the craft were of 5 meters in diameter and 1 meter 20 in height. The object was stationed at one meter approximately above ground-level and its left side as seen from where the witness stood seemed to shine as if it were made out of golden metal. On the left of the machine, stood a being of approximately 1 meter 60 of size. His head was clothed with something very adjusted like a helmet or a mask, which wrapped all his head and shone a white gleam. At the time when the witness arrived and saw him, the being turned his head around looked towards the witness. The witness then realized that some sort of veil which started from the face and went down to the chin where it was clearly cut, with a bulge at the level of where the nose normally is, hid the face of the being entirely. The character then suddenly started to utter odd sounds as if he spoke to somebody. At this time the witness notes that indeed a second creature is squatted under the machine as if it made an examination or a repair of it. Apparently hearing the first character, the second moves back of some step while remaining curved then once he was out of the lower part the machine, he stood and turned around. The witness can then see that this second character is dressed in the same manner than the first, with the same veil on the face, but is smaller, of less harmonious proportions and a larger head. The second character, when he turned around, touches an object he carries on the belly. From there, a beam of white light spouted out, and touched the witness who found himself paralyzed. Terrified and unable to flee, the witness saw the two characters approaching him while exchanging high pitched vocal sounds. When he arrived at ten centimeters of the witness, the smallest being raised his veil which hid his face using the left hand. He seems to make a gesture to invite the witness to look at his face. The horrified witness described that the face of this being was frightening, with disjoined lips showing all his teeth, which were white and regular. The face was very high and very broad, the cheeks were embossed and the chin quite pointed. The nose was very thin and nozzle like an eagle's beak. The being has a beard strewn on the right cheek and a skin of tanned complexion. The eyes, which initially appeared to the witnesses as simple holes in orbits, comprised neither iris nor pupil but only one enormous white sphere. From the left eye, a brown liquid run down to the corner of the lips, which was a particularly horrifying sight to the witness. The creature then let the veil fall back down, and seems to get agitated as if trying to convince the witness to come into the machine. The first character seemed to invite his companion to calm down and to give up inviting the witness on board. Both then slowly moved towards the machine and went up on board with difficulty, one helping the other. The witness did not manage to distinguish the opening but the two beings did enter. The witness heard a metallic noise as that of a metal door which closes, then a lighter metallic noise of which he compared to the noise of a hand rubbing corrugated metal sheet. At this time, the witness lost consciousness. When he came back to his senses, he saw that the machine is now at ten meters above the ground and at approximately 50 to 70 meters away of him. The machine rotates while emitting a gentle sound comparable with that of a ventilator. Its shape seemed different from that it had when on the ground: the witness now saw two bulges or domes, one between the center and the edge, and the other in the center. There were enlightened portholes on these two bulges. The object did not shine anymore, its contours were now distinct. Then, a violent flash illuminates all the landscape and the machine takes a golden color and became surrounded by an orange halation, which illuminated the vegetation around with this color in an eerie manner. The machine then rose abruptly with a spiraling trajectory and it reached approximately 500 meters of altitude in a few seconds. There, it stopped and remained motionless one moment, then it left horizontally while emitting small sparks which became increasingly important as the machine moved away while taking speed. On the ground level, an odor that the witness did not manage to identify was remaining. The witness came back on the location on the next day to try to find a material proof of what occurred, but he did not find any, simply noting that part of the grass was flattened where the machine and the occupants had been. Not having a proof, he estimated that nobody will believe him. In addition to his report to Jean Chasseigne, the witness apparently also reported his experience to Pierre Bellemare on Europe 1 radio in France in February 1976. The case occurred near a city of the French Riviera on a forgotten date of spring 1954 and the witness definitely wanted to remain anonymous. He told what follows, noted by ufologist Jean Chasseignes. This observation was made during the spring of 1954, without more precision as for the date. On the other hand the witness has a very precise memory of the time: 02:40. It happened near a city of the Riviera, in one of these small valleys that open on the sea. The witness, of which I am convinced of the sincerity, makes a point of keeping his anonymity, being given his extraordinary adventure, one can understand this. Little before the observation, he was returning at his place by foot, and went on a small pathway. It was the night, but there was however a certain visibility. While walking on, he heard a noise like a hammer striking an anvil, then a few seconds later, after having walked from 20 to 25 meters, a noise of voices [or voice]. He did not see any light nor gleam in the surroundings, but the site not being completely isolated, he first thought that it came from a house where a handyman was busy. He resumed his walk as if nothing happened. A crumbling having happened on the path, he took a way which crossed a private property to continue his travel, which he entered by a demolished wooden gate, which he this did not have to open. He was on a terrace, of the usual type in the Riviera, delimited by a dry stone wall, on which one cultivates olive-trees, orange-trees and other species. Going on for a few meters, he borrowed a stone staircase of some steps, to continue his way to the lower terrace. At this point in time, Mr. B...'s strange and distressing adventures began. Hardly had he gone down the staircase, that he was confronted to a display he was far from expecting, and he stopped, amazed. In front of him, at hardly ten meters, a luminous and shiny object was posed on the ground. It was a machine of discoid shape, more convex on the top, and carrying a small dome in its top. The left part was shining like gold. It had a diameter which he estimated as 5 meters, a thickness in its center of approximately 1 meter 20 and it stood with one meter above the ground roughly. Mr. B... is unable to remember if the machine was or was not posed on feet. On left of the object, a being stood upright, of 1 m 60 approximately, very thin and of harmonious proportions. He made on Mr. B... an impression of only one very adjusted piece of clothe (affirmed detail, well specified), which included the head. It shone of a white gleam "as a crushed firefly" as Mr. B... later said, what makes think that it was rather phosphorescent. The being has his back towards the witness, but on his arrival he turned the head and had a movement of surprise when seeing him. In front of his face, there was a sort of veil that started from the face, clearly cut at the level of the chin, of the same color than the combination. The veil carried a bulge at the level of the nose. The being then pronounced some words directed to a second character that Mr. B... had not discovered yet. The exchanged words were not understood by the witness, but he specified to me that it was in a very clear language. This number 2 was, quite likely, under the object. He appeared squatted, perhaps busy making a repair, and with the call of number 1, he made a few steps back, while remaining curved, before turning around suddenly while he stood up. He was smaller than the first, of less harmonious proportions, the head a little larger. He was dressed in the same manner and carried the same veil that hid his face. He had something on the belly. While turning around, he put his two hands to this object which resembled a flashlight, and took a step ahead. At once, from this object held with two hands, a beam of white light came out, and Mr. B... felt more and more extremely "paralyzed", at the same time as the emitted light grew bigger until becoming a square of 20 square centimeters. The light was white like that of a flashlight. The paralyzed witness could not move any more, but he continued to see and hear, but rather with difficulty. He also had difficulties in breathing. The number 2 said something very brief to the number 1, and approached the witness, as if he wanted to check the effect of the pencil of light, and undoubtedly of the related paralysing radiation. The two beings exchanged some words, but there emanated no tone of aggressiveness on behalf number 1. Number 2 appeared more relaxed after having noted the state of Mr. B... He then approached up to 60 centimeters from the head the witness, and the top of his head arrived at the height of the neck of the witness, which provides a rather precise height of 1 m 45. He then raised his veil with the left hand, while raising the head towards the witness, apparently so that the latter can see his face perfectly. He grinned in a horrible way, the disjoined lips discovering all his teeth and, with his right arm, he made a gesture, like inviting the witness to observe his face in detail. I do not know if this detail has importance, but the memory of this scene accurately remained engraved in the witness' memory, who felt all that it had of pathetic, and perhaps of desperate. The number 2 released his veil, which fell down on its face, and with his two arms, and twice, he made eloquent gestures, as if to encourage the witness to follow him. At the second attempt, it even seemed to Mr. B... that the invitation was more pressing, with somewhat of irritation, but there was no attempt of abduction. At this time number 1, who seemed to be the leader, intervened, and number 2 calmed instantaneously. The two beings then turned themselves around and quietly moved towards the apparatus in which they entered, on the top, not without difficulty, helping themselves mutually, one pushing the other, the first on top pulling the other. Mr. B... saw them disappear in the machine without being able to specify where, he did not notice any opening although he heard a dry noise of metal closing. A little later he heard another noise, soft, as if a hand passed on a piece of corrugated iron, then he remembered nothing anymore, having lost consciousness. Description of the face of the being number 2. Very high and very broad face. High cheekbones. Pointed and rather sharp chin. Very fine nose and in the shape of an eagle's beak. Very thin lips. White and regular teeth. Beard strewn on the right knob. Skin of dark color (Mediterranean type). The witness did not see hair on the head, which was hidden by the combination including the head, as I said. The eyes were slightly more apart than on a normal face, probably with eyelids. The witness does not have the memory of having seen lashes and eyebrows: this does not mean that there were none. The shape did not differ much from the normal eyes, perhaps a light Asian type. They were larger and globulous. Initially, it had seemed to the witness that the character did not have eyes, simply holes in the orbits, then he saw in the left orbit a white sphere, without iris nor pupil. Was this that that the being wanted to show him? We will never know anything of it. It was horrible to look at, and Mr. B..., 18 years afterwards, never speaks about it without an intense emotion. Of this left eye, a large tear of a thick and brown liquid ran, which went down to the corner of the lips. When Mr. B... regained consciousness, the apparatus was not any more in front of him, but at ten meters of the ground, 50-70 meters of distance. It rotated counter-clockwise, with a light noise of ventilator. The shape was completely different from that which he had noted on the ground. The apparatus was on the section and the witness had precise memories of detail: see the sketch of the profile. There was on its periphery 3 or 4 undulations, resembling stiffeners. A first bulge at the half of the diameter, and a second in the center (probably the cockpit). Illuminated port-holes were on one of the two bulges, perhaps on both, the memory is vague. Mr. B... had the impression that the central cockpit did not turn at the same time as the apparatus. Moreover it seemed to him that somebody observed him from behind a port-hole, and the observer did not have a veil on the face. At this time, the object did not shine any more, it was gray, but contours were clearly distinguished. At ground level there was an indefinable odor which disappeared quickly. Then there was a violent flash that illuminated all the landscape, like a firework, whereas the machine became gilded like gold, surrounded by an orange halation. It started to rise at once in spirals, reaching a height of 5 or 600 meters into 4 or 5 seconds. It stopped, remained motionless a few seconds, then it left horizontally, initially all gently, while emitting small sparks, then as it accelerated, the sparks became more numerous, it finally reached a high speed and a tail of sparks followed it. Mr. B... returned at his place somewhat moved, he said to his wife that it had just seen something extraordinary but without giving details to her. The following day he used the same path again, not without some fear, but he did not dare to go on the very spot of the landing, noting however that the grass was pressed and laid down at this precise place. He never revealed all these details, the initial reactions of his friends when he vaguely approach the topic of this adventure had sufficiently enlightened him on what awaited him if he had been more precise. This secrecy stressed him, and he needed to share this adventure with someone else. I thank him for the confidence that he placed in us, and I promise him that his anonymity will be respected. Yves Naud indicates that at an unspecified date of the Spring of 1954, a witness, "M.B." whom he keeps the anonymity returned home, by night, walking, close to a city of the Riviera, when he heard a noise similar to that of a hammer striking an anvil, followed-up one minute later of a shout of a voice. He thought that these noises came from a very close house, and continued his walk by a private way which was familiar to him and which led to a terrace then to steps leading to a second terrace. He had hardly descended the few steps that he stopped in awe, because ten meters in front of him, posed on the ground, was a luminous discoidal apparatus with a small dome at its top part, of a diameter of 5 meters and a thickness of 1.20 meter, whose witness seems to remember that it stood approximately on meter above the ground, and which left side appeared to shine like gold. On left of the object, he saw a very thin creature of harmonious proportions of 1.60 meters approximately, who carried a very tight outfit including the head and shining of a white gleam "like a crushed firefly." On arrival of the witness, this "little being" turned his head and looked in surprise. He has some sort of veil staring on the forehead, cut short at the chin and reinflated at the level of the nose, which hid all its face. The being suddenly uttered guttural sounds seemingly to someone else, and the witness then noticed a second being squatted under the apparatus, undoubtedly busy with some repair. At the call of the other, this "repairer" moved back one or two steps while remaining curved, then turned while standing up. It was small that the first, with a larger head and less harmonious proportions, but wearing same clothing and with a similar veil which hid the face to him. While turning around, he had touched an object which he carried on the belly and the witness at once saw a beam of white light spouting out "which paralyses him literally." He was frozen in terror, unable to run away, and saw his two "attackers" approaching while exchanging some words. When they were not any more that within ten centimeters of him, the smallest raised his veil with the left hand, which resulted in an unforgettable vision of a awful face, with disjoined lips discovering all the teeth. "The horrid creature" made a gesture of its right arm, as inviting his victim to look at him, his appearance described 18 years by the witness with the precision of an identification sheet: a very high and very broad face, high cheekbones, a pointed and rather strong chin, a very fine nose like an eagle's beak, very thin lips, white and regular teeth, a beard strewn on the right cheek, a skin of dark color of Mediterranean type. The witness had initially taken the eyes for simple holes in orbits, but he then saw that they had neither iris nor pupil but were simply an enormous white sphere, with, as horrible detail, a thick and brownish liquid running down from the left eye, down to the edge of the lips. The creature then let fall down its veil and in an intense state of excitation, was agitated feverishly like if inviting the witness to go up in the craft, but at this time the first character, who appeared to be the chief, intervened and calmed "his turbulent companion." Both then moved slowly towards their apparatus, sent inside with difficulty by helping each other, and the witness who could not notice any opening saw them disappearing and perceived a deaf noise of metal closing, followed of a lighter sound like that of a hand than one passes on a metal sheet. He then lost consciousness. When he came back to his sense, the apparatus was ten meters above the ground and to approximately 50 to 70 meters distant, rotating while producing a light noise of ventilator and its shape seemed different from that it had on the ground. In spite of the distance, the witness could see two bulges, the first at the half of the disc's ratio and the second in the center, carrying enlightened port-holes. At this time, the object did not shine any more, its contours were still distinct, and it left for a short moment an indefinable odor above ground-level. There was then a violent flash which illuminated all the landscape and the apparatus, which took a gilded color, was surrounded by an orange halation which lit the vegetation. The apparatus then suddenly rose in spiraling motion, reaching a height of 500 or 600 meters in a few seconds, then stopped, remained motionless one moment, set out again horizontally while emitting small sparks which increased as its speed increased. The witness came back on the spot the next day to look for evidence of his incredible adventure and noted that the grass was pressed at the very place where the machine had been posed, but as this proof was meager, he remained convinced that nobody would believe him. The author indicates that at 2:40, a peasant of Provence was one day of spring 1954 face to face with two flying saucer pilots, who were normal men, quiet, without hostility, who were repairing or checking their craft in the clear night of the French Riviera. One of them was ugly, but "this happens with our fighter pilots, these modern demigods. The other pilot, according to the investigator Mr. Chasseigne, a French ufologist of reputation, had a 'very high and very broad face, high cheekbones, a pointed chin and a rather extremely fine nose, in eagle's beek, thin lips, white and regular teeth, the skin of dark color, normal eyes, perhaps of slightly asian type'." The author wonders with his usual humour "How many girls with a heart in love will be seduced by the exotic charm of our evening visitors? Who can tell?" These authors report that in spring 1954, at 10:00 p.m. or 2 after midnight, near Menton in the Alpes Maritimes, at the location "Le Beauriqueau", the witness which remained anonymous except to the investigators in Nice, returned at his place by walking. He was at this time at the location "Beauriqueau." He first heard of all sorts of "hammer-like striking an anvil" noises. He resumed his walk, then heard the sound of a voice. He walked some more ten meters and discovered a luminous object then. He described it as of disc shape, more bent on the top and carrying a small dome at its higher part. The left part of the object was shining like gold. The diameter was estimated as five meters for a 1.20 meters thickness. The object was 1 meter above the ground. Close to the object, a being of 1 m 60 approximately stood, of very slim and harmonious proportions. He was dressed of a combination in only one piece, very adjusted, including the head and of a phosphorescent white color. A second being was under the apparatus. As soon as they realized the witness' presence, they paralyzed him using a luminous ray. They approached the witness, then regained their apparatus, entering into it by the top. The witness lost consciousness. When he recovered, the object was rising while rotating, with a light ventilator noise. An indefinable odor spread, and disappeared quickly. After a violent flash, the machine illuminated, rose quickly, hovered, then set out again horizontally, slowly, by emitting small sparks and disappeared. The authors indicate that their sources are Lumières Dans La Nuit N.128 page 8, an interview of the witness at "CQFD" by Pierre Bellemarre on Europe 1 radio in February of 1976, and François Lagarde's book pp 133 à 137. They note that the time indicated in L.D.L.N is 2 in the morning whereas the witness indicated 10:00 p.m. at his radio interview. The author indicates that in the Spring of 1954, on the Riviera, at 02:40 in the night, "M.B. ", who asked for anonymity, discovered on the ground a lenticular apparatus close to which "were located two humanoids." When one of the beings became aware of the presence of the witness, he had a movement of surprise and alerted his companion, who put his two hands at his "belt"; he had something on the belly that resembled a flashlight. From this object held with two hands, at once, a beam of light left and the witness was instantaneously "paralyzed." The two beings regained their apparatus and the witness lost consciousness. Jean Sider provides a summary based on the investigation by Mr. Chasseignes and indicates the Lumières Dans la Nuit and Figuet - Ruchon references as sources. Monsieur B was walking home when he came upon a brightly luminous object standing on or hovering over the ground, only 10 meters away; a discoidal craft 5 meters in diameter, the upper part more curved, and with a small dome. Beside it stood a slender man 5"2' tall, wearing a luminous tight fitting one piece suit including the head. When he turned toward Mr. B he was seen to have a veil in front of his face. He spoke some words to a second being, shorter 4'9" and with a larger head, who wore a similar garb. On his abdomen this 2nd entity wore a sort of flashlight, from which a beam of white light was turned on B, paralyzing him. Then this 2nd entity raised his veil, revealing a grin on his face that exposed all his teeth. His forehead was high, the chin and nose pronounced, the lips very thin, and the complexion dark. The eyes were white, showing no iris or pupil, and exuded a large brown tear. The being made beckoning gestures; then both walked to the craft, got onto it, and vanished into it. B heard a metallic noise, then lost consciousness. When he came to himself, the machine was 10 meters above the ground, 50-70 meters away, and was spinning, making a faint noise. Its shape now differed, showing 2 illuminated portholes on a bulge. There was an "indefinable" smell. After a bright flash of light, the object became gold-colored; it rose in a spiral, the moved off leaving a trail of sparks. The next day B found flattened greenery at the site. The witness heard a loud clanking sound then looking outside his home saw a five-meter domed disc land. Two human-looking occupants wearing gray combination suits exited the craft. The whole time the witness was paralyzed by a beam of light coming from the UFO. No other information. 1954 - The witness heard a clanking sound at 2:40 a.m., then saw a five-meter wide domed disc land in Menton, France. Two human-looking occupants left the craft. The witness was paralyzed by a beam of light. (Source: Larry Hatch, U computer database, case 3317). 02:40: In Menton (Alpes-de-Haute-Provence), a witness observe the occupant of a landed saucer seize a tubular object hanging at his belly (girdle?) and to direct it towards him, who feels paralyzed. Then, the witness loses consciousness. When he regained his sense, the saucer has taken off and moves away from the witness [LDLN n° 126, p. 8] [Figuet, p. 169]. Luc Chastan indicates that in the Alpes Maritime in Menton in 1954 at 22:00 "One evening of spring, the witness walks back home. He is at this time at the location 'Beauriqueau'. He first hears like noises of hammer striking an anvil. He continues his walk, he then hears a noise of voice. He still crosses ten meters and then discovers a luminous object. He describes it as of discoid shape, more bent on the top and carrying a small dome at its higher part. The left part of the object was shining like gold. Diameter estimated as five meters for a one meter twenty thickness. The object was within one meter of the ground. Close to the object stands a being 1 m 60 tall approximately, very thin and of harmonious proportions. It is dressed of an outfit of only one very adjusted piece including the head and of phosphorescent white color. A second being was under the apparatus. As soon as they realize the presence of the witness, they paralyze him using a luminous ray. They approach the witness, then go back to their apparatus entering by the top. The witness loses consciousness. When he recovers, the object rises while turning on itself, with a gentle ventilator noise. There isan indefinable odor which disappears quickly. After a violent flash, the craft is illuminated, rises quickly, is immobilized, then starts again horizontaly, slowly, while emitting small sparks and disapears." The website indicates that in March 1954 at 02:40 in "Cote D'Azure, France," "Domed disc on ground. two 5' tall humanoids zap witness with a tube. Gestures, paralyzed." "Close encounter with a an unidentified craft and its occupants. One domed disc was observed on the shore for 30 minutes. Two 5-foot-tall beings were seen." The sources are indicated as "Lumieres dans la Nuit; Hatch, Larry, *U* computer database, Author, Redwood City, 2002." On his blog a French ufologist publishing under the pseudonym "exobio" copied the [go1] source without giving credit. Mr B was walking home along a small path when he heard a sound like a hammer striking an anvil, and a few seconds later, when he gone a further 20-25m, he heard a voice. He first thought the sounds came from a nearby house and carried on his way, down a terrace on some private property. There, after he had only gone a few steps, he encountered no more than 10m away, a brilliantly luminous disc, the upper part of which was more curved, and with a small dome in the centre. The left hand side of the disc was shining like gold. This disc was about 5m in diameter, 1.2m thick and was suspended about 1m above the ground. To the left stood a slim, well-proportioned being, about 1.6km tall, wearing a tight fitting one piece suit, which shone with a white phosphorescent glow, and which covered its head. The being gave B a feeling of harmony and sympathy. As B approached, this being, which had had its back turned to him, turned round and gave a start of surprise. The being’s face was covered by a veil of the same material from the forehead to the chin. The first being then spoke a few words to a second one, which only now came to B’s attention. Though clad in the same kind of suit, this second being was smaller and less well proportioned, with a large head. As this second being turned round it touched something like a pocket torch that it was wearing on its abdomen. As B took a step forward, a beam of white light came from this object, hitting and gradually paralysing him. The beam grew until the funnel was 20cm by 20cm. B now had difficulty in hearing, seeing and breathing. The two beings continued to exchange a few words in their incomprehensible but articulate language, and the second one came up to within 60cm of B, who could now estimate its height as between 1.45-1.46m. It then lifted its veil to reveal a “horrible” toothy grin, a high, wide forehead, pointed chin, thin “eagles beak” nose, thin lips, a wispy beard on its right cheek and darkish skin. The eyes were set farther apart than normal and were larger and more globular than a human’s, and consisted of just a white globe with no pupil or iris, and from its left eye their rolled a thick brown tear. This figure then left its veil drop down and gestured to B to follow it, with impatient gesture, but was then calmed down by the larger being, and they walked back to the machine, which they re-entered with some difficulty. B was unable to see exactly how they entered, but heard two metallic sounds, after the second of which he passed out. When he recovered his senses, the object was at 10m altitude, some 50-70m away, spinning anticlockwise and making a humming sound. On its upper outer periphery the machine had three or four ripples; there was a smaller bulge at half the radius and in the centre top, a second, larger, protuberance. There were two illuminated portholes on at least one of these bulges, through which he had the impression that an unveiled figure was observing him. The object had now lost its luminosity and appeared grey, and he noticed an indefinable smell. The machine then emitted a powerful flash that lit up the countryside and took on a golden hue with an orange halo, and spiralled up to 500-600m in a few seconds, remained stationary for a few seconds, then moved off, horizontally, slowly at first, emitting sparks, which increased as it accelerated. It vanished at high speed, leaving a long trail of sparks. B was very shaken by the experience. Next day he returned to the site and noticed trampled and flattened grass, but was too afraid to investigate. FSR 21, 2, p.17, citing J. Chasseigne in LDLN 126 citing his own investigation. *Apr. 1, 1954 - The witness heard a clanking sound at 2:40 a.m., then saw a five-meter wide domed disc land in Menton, France. Two human-looking occupants left the craft. The witness was paralyzed by a beam of light. (Source: Larry Hatch, U computer database, case 3317). See the le file about this case in my CE3 catalog. The issue with this report is that it is anonymous and late; there is no possibility of checking and investigating, and no evidence were raised. Thus, the story is a matter of "believe it or not." At best, it appears that the witness did not show a publicity-seeking behaviour. [jc1] Personal file, French ufologist Jean Chasseigne, 1973. 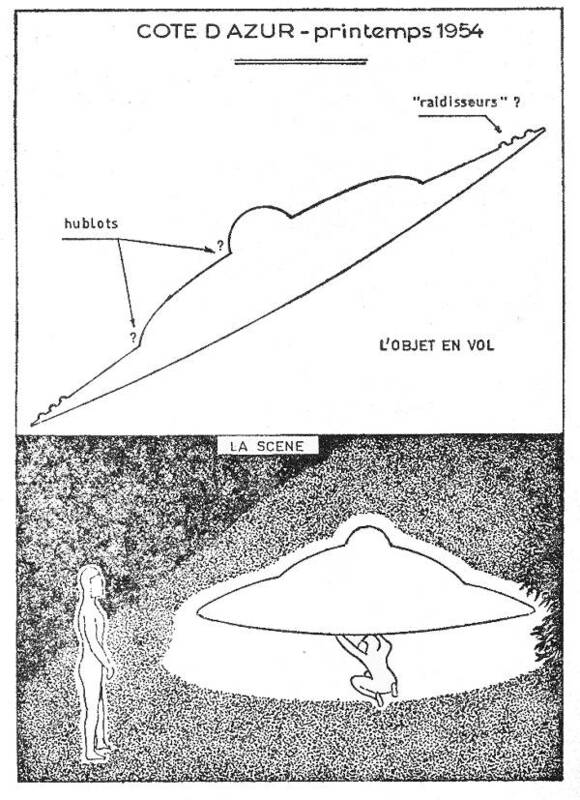 [jc1] Article by the French ufologist Jean Chasseigne, in the ufology magazine Lumières dans la Nuit (LDLN), France, N.126, page 8, June 1973. [jc2] Article by the French ufologist Jean Chasseigne, in the ufology magazine Flying Saucer Review (FSR), U-K., Volume 21, #2, page 17, August 1975. [---] Interview of the witness on the radio show CQFD hosted by Pierre Bellemarre, Europe 1 radio, France, February 1976. [yn1] "Les O.v.n.i. et Extraterrestres Dans l'Histoire - Volume 3", book by Yves Naud, Famot publisher, Switzerland, pp 19-23, 1977. [hj1] "Chasseurs d'OVNI", book by "François Gardes", pseudonyme of Henri Julien, Albin Michel publisher, France, page 146, 1977. [fr1] "OVNI - Premier Dossier Complet des Rencontres Rapprochées en France", book by Michel Figuet et Jean-Louis Ruchon, Alain Lefeuvre publisher, France, pp 69-70, 1979. [---] "Les Apparitions d'Humanoïdes", book by Erich Zürcher, Alain Lefeuvre publisher, France, pp 155-156, 1979. [pd1] "Contacts du 4e Type - Les OVNI Précurseurs de Notre Avenir", livre par Pierre Delval, de Vecchi éditeur, France, page 188, 1979. [js1] "Le Dossier 1954 et l'Imposture Rationaliste", book by Jean Sider, Ramuel publisher, France, pp 159-160, 1997. [dj1] "Encounters With Aliens On This Day" web pages, by Donald Johnson, USA, circa 2002, at www.ufocat.com/on_this_day/April01.html. 0.1 Patrick Gross September 28, 2007 First published. 1.0 Patrick Gross October 1, 2007 Conversion from HTML to XHTML Strict. First formal version. 1.1 Patrick Gross October 20, 2009 Additions [go1], [ex1], [ud1]. 1.2 Patrick Gross February 24, 2010 Addition [lc1]. 1.3 Patrick Gross March 18, 2010 Addition [hj1]. 1.5 Patrick Gross October 18, 2014 Additions [ni1], Summary.